I can’t get enough peaches this year. Don’t know what it is. Usually I mix it up. 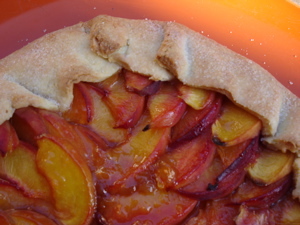 A few plums, some nectarines, and also peaches. But this year, the other fruits tend to sit in the bowl while the peaches disappear, so I’ve given in. I’ve got about a $15-$20 a week peach habit at this point (for two of us). I keep gravitating to Blossom Bluff for some reason and I really feel good about this relationship. I think it was meant to be. The reason: the one time I bought from another vendor I ended up leaving them at another stand and I didn’t notice they were missing until I got home. I like the yellow ones with plenty of acid in favor of the sweeter, white varieties. My favorite has been the variety with the red stripy flesh. I can’t remember what it’s called, but you can ask them. And I haven’t just been eating them. I’ve even been baking. Pies and gallettes. Kind of a big deal for me. Too bad this relationship can’t last forever. The pie is Luella’s pie from the Jimtown Store cookbook. The secret: pour cream over it before you bake it. mmmmm. 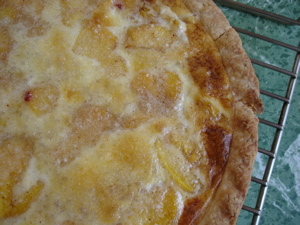 Peaches and Cream pie! This entry was posted in from the market. Bookmark the permalink. Post a comment or leave a trackback: Trackback URL.